Guyana proves a challenge for adventurous travellers. 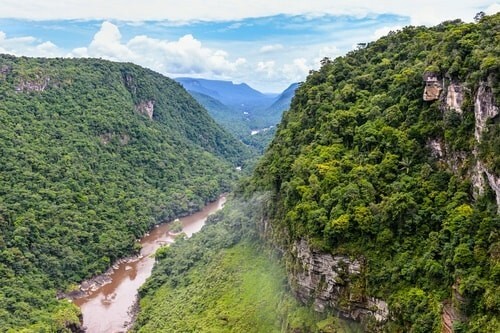 Situated between Venezuela, Brazil, the Atlantic Ocean and Suriname, the country is almost invisible on the map but stuns you with its wild and thrilling landscapes. Enjoy isolated waterfalls such as the Kaieteur found deep in the Amazon, which is a pleasure to share as a group of friends. The Canister falls on the Essequibo River makes for another beautiful visit. Hiking enthusiasts will enjoy the Iwokrama forest where it possible to camp, or perhaps a visit to the Rupununi savannah. These places offer an array of wildlife such as jaguars, black caimans, anaconda, parakeets or storks. The coastline of Guyana, particularly Shell Beach, is best experienced in April and offers a chance to swim or relax. Last Updated: April 02, 2019 10:32 ESTThe Health tab was updated - travel health information (Public Health Agency of Canada). The quality of health care in Guyana is far from European quality standards, largely due to limited treatment and unqualified doctors. St. Joseph’s Mercy Hospital is recommended, as it provides basic care in good sanitary conditions. Davis Memorial Hospital & Clinic is another option. Pharmaceutical products are not satisfactory in Guyana, and it is therefore advised to bring basic medications and a first aid kit if visiting. It is worth noting that many ambulance drivers only provide transportation and not medical care, but nonetheless, they can be accessed by dialling 913. Is Guyana Safe for Travel? Do I Need a Visa to Visit Guyana? Only a passport is required to enter Guyana for trips under 90 days. Your passport must be valid for at least six months beyond the date of departure.